We feel bad criticizing a guy who gets it right so often and puts so much effort in, but you know? We think we’ll get over it. We’ll be fine. Michael B Jordan attends The CinemaCon Big Screen Achievement Awards at The Colosseum at Caesars Palace in Las Vegas, Nevada in a Z Zegna suit paired with a white shirt, red tie, and Christian Louboutin shoes. As gorgeous as those shoes are – and they’re positively drool-worthy – we just can’t sign off on that shade of brown with dark a shade of gray or near-black. There are a lot of opinions out there about the brown shoe in menswear and we wouldn’t try to stake a claim on any one rule ourselves. Generally, we think you can wear brown with gray and blue suits, but the brown in the shoe can’t be lighter in tone than the blue or gray of the suit. That’s our take. There are plenty of others. Our take pretty much doesn’t allow for brown shoes to be worn with black or near-black suits at all, but that’s a sacrifice we’re willing to make, darlings. A line must be drawn. 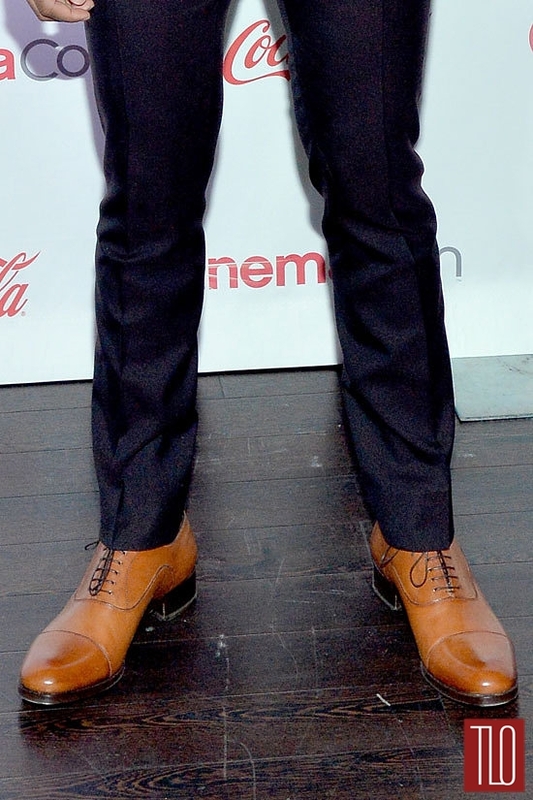 He, of course, looks beautiful, regardless of his shoe choice.